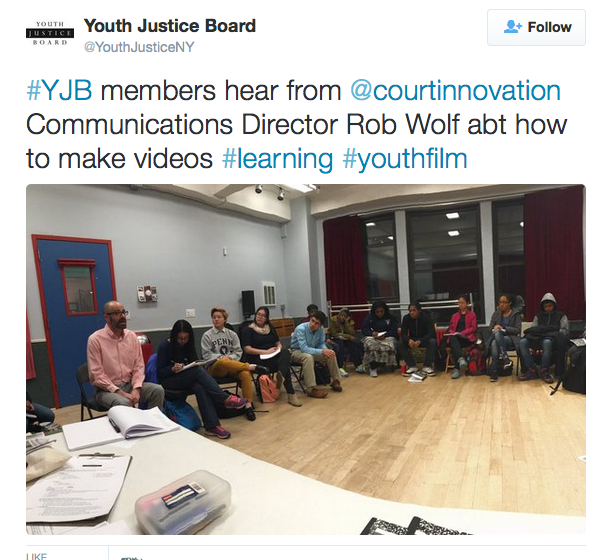 I spoke to members of the Youth Justice Board this week about how to make a video. The board is a very cool teen leadership program that teaches New York City high school students how to analyze policies that affect teens and do something about them. They tackle subjects like truancy, kids in foster care, school safety, and kids and crime. This year’s group is planning on making a training video for police officers that provides youth perspectives on cop-teen interactions, and they asked me questions about the videos I’ve directed and edited. Before I spoke, they placed me in the “hot seat”– a chair at the front of the room where they asked me rapid-fire yes-no questions for seven minutes: Have you been to Europe? Have you ever gone hiking? Do you eat shrimp? Do you know anyone famous? Do you have kids? And then they asked great questions about how to make a video–so great, that I didn’t always have the answers. I’ll be helping them now and then, especially toward the end during the editing. If their thoughtful questions are any indication, I’m sure they’ll come up with wonderful footage to work with.